At Compass Group, we are a family of great companies delivering the best in food, hospitality, and support services. At Compass, we care deeply about the quality of the food we provide, as well as the steps we take to produce it. We prioritize social and environmental responsibility to ensure we’re serving the best products possible. Each member of the Compass family adds a unique perspective and attention to detail that helps us create an unforgettable experience. Compass Group is firmly committed to providing balanced, nutritious food options that fit every diet. Our focus on health and wellbeing is reflected in our decisions to source animal proteins raised without antibiotics, cage-free eggs, and sustainable seafood. We make healthy choices easy by providing tasty food and helpful resources that fit any lifestyle. Compass Group and the Coalition of Immokalee Workers (CIW) signed a landmark agreement on September 25, 2009, that would forever change the food industry and the hearts and minds of Compass associates. Our global food system is operating above the resource capacity of the planet and we are facing an increasing need for food production to match an expanding world population. For change to happen, both individuals and large organizations must take ownership of that future and step up to the challenges we face. In 2016, Compass Group USA become the first foodservice company to commit to 100% healthier, slower growing chicken by 2024 through landmark Global Animal Partnership (GAP) agreement. Compass Group targets 100% of canned skipjack tuna as Fish Aggregating Device (FAD)-Free beginning January 1, 2015. This change in sourcing will impact over 1.9 million pounds of skipjack tuna, more than 50% of Compass Group’s total canned tuna purchases annually. Incredible people behind your food. Enabling guests to explore their food. Comfort and convenience beyond the traditional. In an exclusive partnership, José Andrés’ ThinkFoodGroup and Compass Group USA combine best-in-class culinary creativity and operational excellence in an unprecedented joint-venture powerhouse. Compass Group partnered with the Coalition of Immokalee Workers (CIW) to pay an additional 1.5 cents per pound for all the tomatoes they purchase annually in Florida, with 1 cent per pound being passed from the supplier directly to the harvesters, resulting in as much as a 64% wage hike for harvesters picking tomatoes for Compass. A code of conduct guarantees fair wages and eliminates abuse and sexual harassment. The Culinary Institute of America (CIA) and Restaurant Associates (RA) have formed a partnership to foster innovation in the contract foodservice industry. In support of CIA’s aspiring chefs, Compass Group and RA have also made a substantial commitment to increasing student scholarships. StarChefs is a national network of locally-focused Rising StarChefs, mixologists and restauranteurs available for on-site guest appearances, Teaching Kitchen and FoodWorks. Steelcase transforms traditional real estate into destinations for connection, collaboration, focus and innovation – leading the way to create great experiences with a range of architecture, furniture and technology solutions. 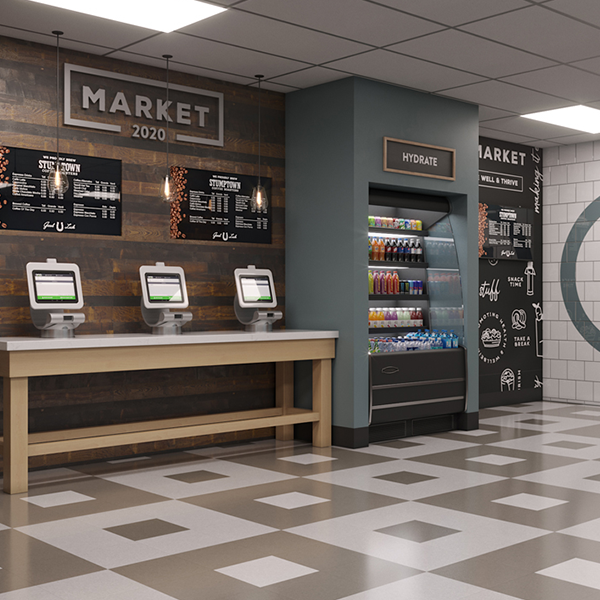 Compass Group USA is driving change from the inside out with a landmark commitment to reduce food waste by 25% by 2020. We’re reducing waste at the source, raising awareness, and promoting solutions that positively impact the areas where we operate. The Support Services division of Compass Group provides expert non-food services to healthcare (Crothall Healthcare and TouchPoint Support Services), business and industry (Eurest Services), and educational (SSC Service Solutions) organizations. Support services are a natural complement to foodservices, resulting in superior customer care and efficient professional operations. Compass Group demands a high caliber of expertise in food and service, as well as strength in data management, marketing, customer relations, and supply chain logistics. Our purchasing group, Foodbuy, LLC, is able to meet the demands of our company while supporting our commitment to diversity. Compass Group USA has taken a leadership role within the foodservice industry regarding farm animal welfare.